Four covalent bonds. Carbon has four valence electrons and here a valence of four. Each hydrogen atom has one valence electron and is univalent. In chemistry, a valence electron is an outer shell electron that is associated with an atom, and that can participate in the formation of a chemical bond if the outer shell is not closed; in a single covalent bond, both atoms in the bond contribute one valence electron in order to form a shared pair. The presence of valence electrons can determine the element's chemical properties, such as its valence—whether it may bond with other elements and, if so, how readily and with how many. For a main group element, a valence electron can exist only in the outermost electron shell; in a transition metal, a valence electron can also be in an inner shell. 1) It requires relatively low energy (compared to the lattice enthalpy) to remove the extra valence electrons to form a positive ion. 2) Because of their tendency either to gain the missing valence electrons (thereby forming a negative ion), or to share valence electrons (thereby forming a covalent bond). Similar to an electron in an inner shell, a valence electron has the ability to absorb or release energy in the form of a photon. An energy gain can trigger an electron to move (jump) to an outer shell; this is known as atomic excitation. Or the electron can even break free from its associated atom's valence shell; this is ionization to form a positive ion. When an electron loses energy (thereby causing a photon to be emitted), then it can move to an inner shell which is not fully occupied. Valence energy levels correspond to the principal quantum numbers (n = 1, 2, 3, 4, 5 ...) or are labeled alphabetically with letters used in the X-ray notation (K, L, M, …). The number of valence electrons of an element can be determined by the periodic table group (vertical column) in which the element is categorized. With the exception of groups 3–12 (the transition metals), the units digit of the group number identifies how many valence electrons are associated with a neutral atom of an element listed under that particular column. The electrons that determine how an atom reacts chemically are those whose average distance from the nucleus is greatest; that is, those with the highest energy. For a main group element, the valence electrons are defined as those electrons residing in the electronic shell of highest principal quantum number n. Thus, the number of valence electrons that it may have depends on the electron configuration in a simple way. For example, the electronic configuration of phosphorus (P) is 1s2 2s2 2p6 3s2 3p3 so that there are 5 valence electrons (3s2 3p3), corresponding to a maximum valence for P of 5 as in the molecule PF5; this configuration is normally abbreviated to [Ne] 3s2 3p3, where [Ne] signifies the core electrons whose configuration is identical to that of the noble gas neon. The farther right in each transition metal series, the lower the energy of an electron in a d subshell and the less such an electron has the properties of a valence electron. Thus, although a nickel atom has, in principle, ten valence electrons (4s2 3d8), its oxidation state never exceeds four. For zinc, the 3d subshell is complete and behaves similarly to core electrons. Because the number of valence electrons which actually participate in chemical reactions is difficult to predict, the concept of the valence electron is less useful for a transition metal than for a main group element; the d electron count is an alternative tool for understanding the chemistry of a transition metal. The number of electrons in an atom's outermost valence shell governs its bonding behavior. Therefore, elements whose atoms can have the same number of valence electrons are grouped together in the periodic table of the elements. As a general rule, a main group element (except hydrogen or helium) tends to react to form a closed shell, corresponding to the electron configuration s2p6. This tendency is called the octet rule, because each bonded atom has eight valence electrons including shared electrons. The most reactive kind of metallic element is an alkali metal of group 1 (e.g., sodium or potassium); this is because such an atom has only a single valence electron; during the formation of an ionic bond which provides the necessary ionization energy, this one valence electron is easily lost to form a positive ion (cation) with a closed shell (e.g., Na+ or K+). An alkaline earth metal of Group 2 (e.g., magnesium) is somewhat less reactive, because each atom must lose two valence electrons to form a positive ion with a closed shell (e.g., Mg2+). 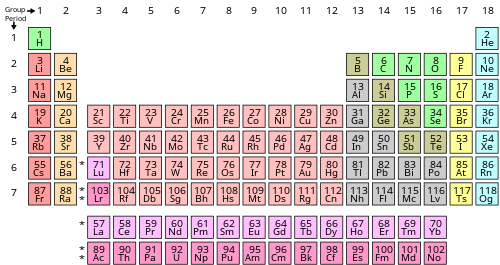 Within each group (each periodic table column) of metals, reactivity increases with each lower row of the table (from a light element to a heavier element), because a heavier element has more electron shells than a lighter element; a heavier element's valence electrons exist at higher principal quantum numbers (they are farther away from the nucleus of the atom, and are thus at higher potential energies, which means they are less tightly bound). A nonmetal atom tends to attract additional valence electrons to attain a full valence shell; this can be achieved in one of two ways: An atom can either share electrons with a neighboring atom (a covalent bond), or it can remove electrons from another atom (an ionic bond). The most reactive kind of nonmetal element is a halogen (e.g., fluorine (F) or chlorine (Cl)). Such an atom has the following electron configuration: s2p5; this requires only one additional valence electron to form a closed shell. To form an ionic bond, a halogen atom can remove an electron from another atom in order to form an anion (e.g., F−, Cl−, etc.). To form a covalent bond, one electron from the halogen and one electron from another atom form a shared pair (e.g., in the molecule H–F, the line represents a shared pair of valence electrons, one from H and one from F). Within each group of nonmetals, reactivity decreases with each lower rows of the table (from a light element to a heavy element) in the periodic table, because the valence electrons are at progressively higher energies and thus progressively less tightly bound. In fact, oxygen (the lightest element in group 16) is the most reactive nonmetal after fluorine, even though it is not a halogen, because the valence shell of a halogen is at a higher principal quantum number. In these simple cases where the octet rule is obeyed, the valence of an atom equals the number of electrons gained, lost, or shared in order to form the stable octet. However, there are also many molecules which are exceptions, and for which the valence is less clearly defined. Valence electrons are also responsible for the electrical conductivity of an element; as a result, an element may be classified as a metal, a nonmetal, or a semiconductor (or metalloid). Metallic elements generally have high electrical conductivity when in the solid state. In each row of the periodic table, the metals occur to the left of the nonmetals, and thus a metal has fewer possible valence electrons than a nonmetal. However, a valence electron of a metal atom has a small ionization energy, and in the solid state this valence electron is relatively free to leave one atom in order to associate with another nearby. Such a "free" electron can be moved under the influence of an electric field, and its motion constitutes an electric current; it is responsible for the electrical conductivity of the metal. Copper, aluminium, silver, and gold are examples of good conductors. A nonmetallic element has low electrical conductivity; it acts as an insulator. Such an element is found toward the right of the periodic table, and it has a valence shell that is at least half full (the exception is boron). Its ionization energy is large; an electron cannot leave an atom easily when an electric field is applied, and thus such an element can conduct only very small electric currents. Examples of solid elemental insulators are diamond (an allotrope of carbon) and sulfur. A solid compound containing metals can also be an insulator if the valence electrons of the metal atoms are used to form ionic bonds. For example, although elemental sodium is a metal, solid sodium chloride is an insulator, because the valence electron of sodium is transferred to chlorine to form an ionic bond, and thus that electron cannot be moved easily. A semiconductor has an electrical conductivity that is intermediate between that of a metal and that of a nonmetal; a semiconductor also differs from a metal in that a semiconductor's conductivity increases with temperature. The typical elemental semiconductors are silicon and germanium, each atom of which has four valence electrons. The properties of semiconductors are best explained using band theory, as a consequence of a small energy gap between a valence band (which contains the valence electrons at absolute zero) and a conduction band (to which valence electrons are excited by thermal energy). ^ Consists of ns and (n-1)d electrons. Alternatively, the d electron count is used. ^ Except for helium, which has only two valence electrons. ^ Petrucci, Ralph H.; Harwood, William S.; Herring, F. Geoffrey (2002). General chemistry: principles and modern applications (8th ed.). Upper Saddle River, N.J: Prentice Hall. p. 339. ISBN 978-0-13-014329-7. LCCN 2001032331. OCLC 46872308. ^ Miessler G.L. and Tarr, D.A., Inorganic Chemistry (2nd edn. Prentice-Hall 1999). p.48.